If you’re looking for a new credit card, consider Discover. They not only offer a resource for scholarships, student loans, and 5% cashback rewards in certain categories during their quarters and 1% on other purchases, but you’ll also receive a $50 bonus (*Must make a least one purchase within the first 3 months). You get 0% APR for your first 6 months, and then standard variable purchase APR of 13-24% What is there not to love and who couldn’t use an extra $50? 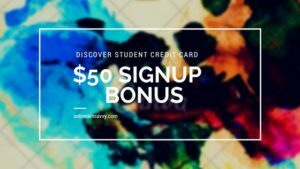 I used Discover as my first student credit card and it helped me build up my credit, offered great cashback bonuses and rewards, and they even sent me a unexpected $5 Starbucks gift card for being their customer. If you’re interested in signing-up, just click here, and if you want to learn more about their student credit cards click here.